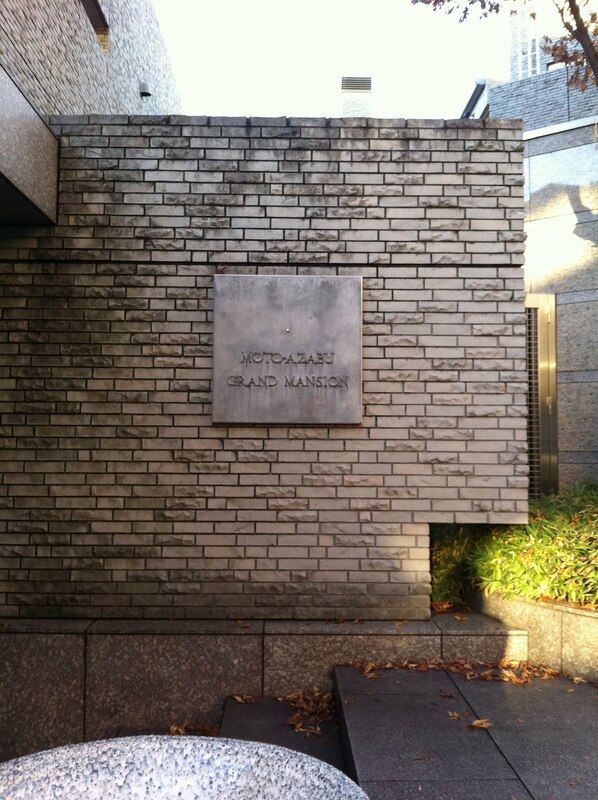 We now know that our old and much beloved building, Moto Azabu Grand Mansion, will be torn down soon. We knew this was coming but preferred to not think about it. Until we moved out in July, this was the only home Eve had ever lived in and the only one that Abby remembered. 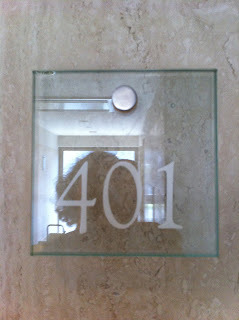 For us, that lovely apartment 401 was laden with memories and history. We were its first and only tenants. But now it is empty and awaiting its demise. Borings have been taken, the legally required kenchiku keikaku (architectural plan) is posted to the side of the building (pictured above) and the drive in front is now fenced off. Even Pippi is deterred. Instead of parked cars, piles of scaffolding sit in its paved roadway, just waiting to be called up for duty. If all goes according to plan, the brick-clad structure will be in the throes of demolition by this time next week. Just around the corner, the 70s vintage (I think) apartment building, Homat Pearl, is a few steps ahead in the redevelopment process. Sorry for the poor picture. 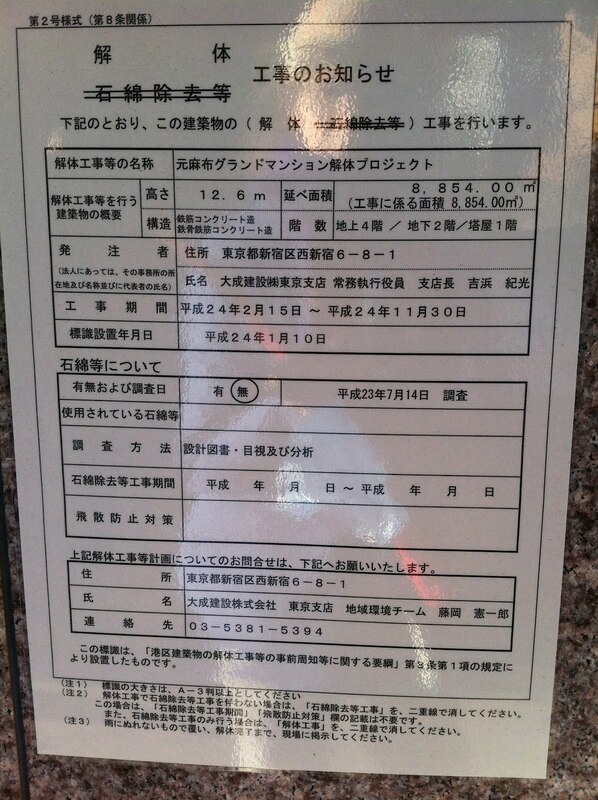 The old building already razed and the site prepared, the groundbreaking is about to happen (I think). 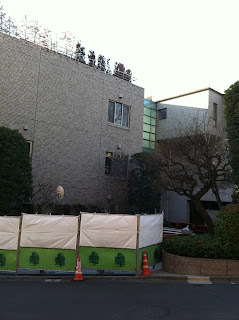 It is a huge site -- I never realized its size until the building was removed. Now that it is gone, there is so much more light and air. But, of course, that will go once the new construction starts. Hopefully these two new buildings will not alter the character of that little S-shaped stretch of street, an unexpected pocket of residential quiet in the shadow of mammoth Roppongi Hills. Now don't get me wrong. I am quite dazzled by Tokyo's ability to reinvent itself again and again and again. This city has a remarkable way of evolving, revitalizing and growing in a very organic fashion. These are marvelous traits that keep the city alive -- no donut issues here. In fact, I would even go so far as to say Tokyo is a model of natural urban renewal that the rest of the world could learn from. The replacement of buildings one by one is a sign of urban health. I do not even mind the disjuncture between adjacent buildings -- there are no cornice lines, street walls or consistent architectural vocabularies to unify. Over the years I have grown quite fond of the odd juxtapositions and strange adjacencies. Though frustrating at times, I have even developed an affection for the quirky Japanese address system that identifies buildings in the order of their completion, not physical location within the block. Yet seeing our former home for one of the last times tugs at my heart just a little. I want the city to replace the worn out and the no longer needed, yet to save the meaningful and the historic -- and not just the front elevation as is sometimes the case ( I loathe facadism). Not to mention the florid wastefulness of destroying a building like the Grand Mansion which is only 16 years old. 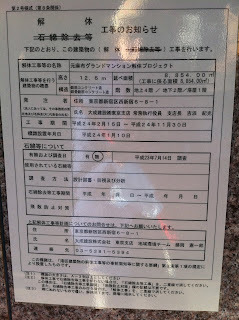 This is young even by Japanese standards. Good Bye, Grand Mansion. 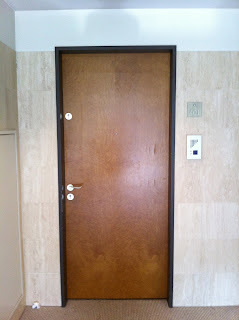 We are sorry to see you go. Enjoyed reading your blog. 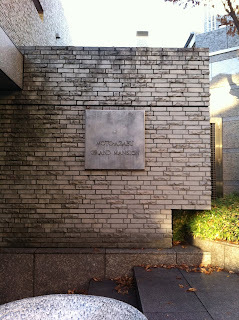 Even though we no longer live in Tokyo and only lived in #502 for a couple of years it saddens me they are tearing motoazabu grand mansion down. 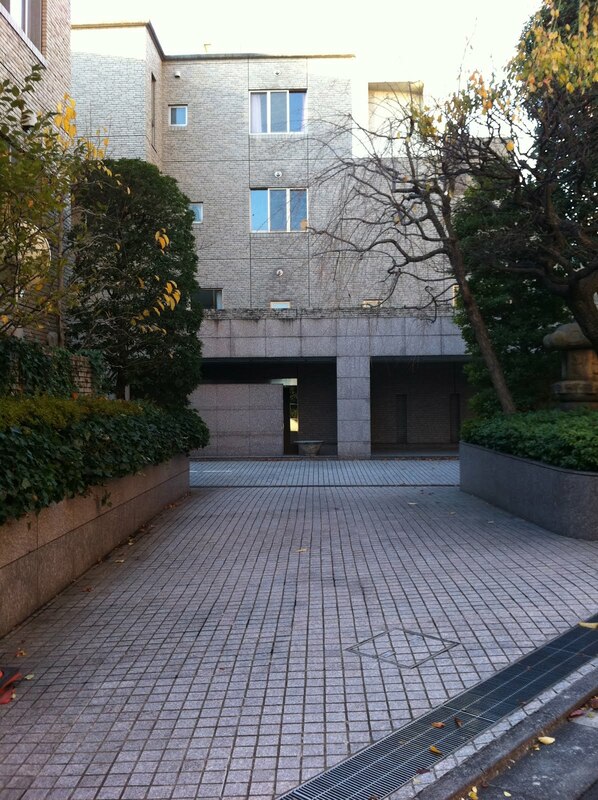 We truly loved that building and our apt and wished we could have lived there the entire time. The Vickrey family. Thank you so much for your comment -- I really appreciated hearing from you. It is good to know that there are like-minded folk out there. I am glad that you enjoyed your apartment as much as we did ours. I imagine that you too have lots of fond memories of our shared building. Sorry to hear about your building. Are you still in the same neighborhood?